Does a Lie Told Often Enough Become the Truth? 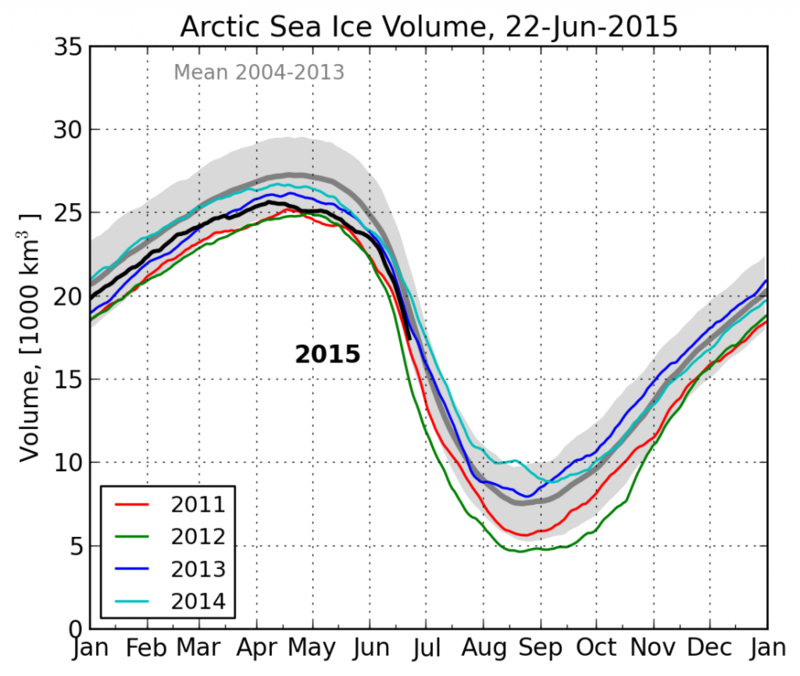 Arctic sea ice is melting very slowly, and is nearing a mid-summer high for the past decade. 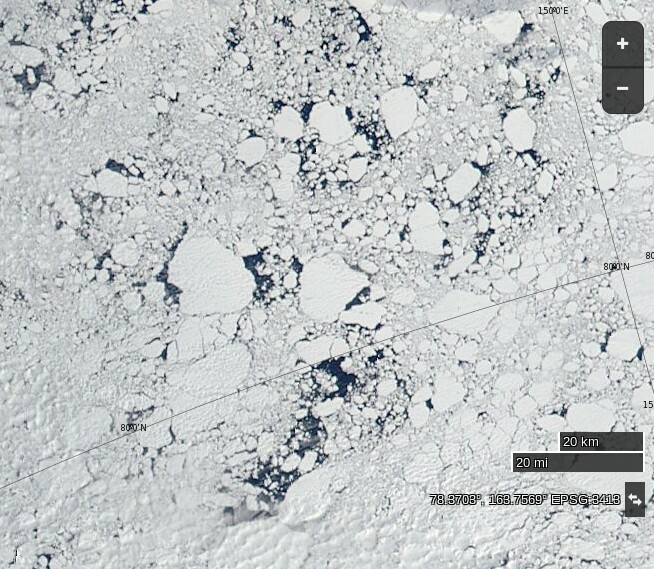 Arctic sea ice looked like this on June 20 – nothing like the fake picture in their May 5 article. 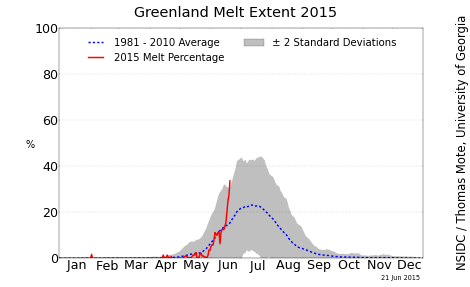 The Greenland melt season started more than a month late, and has seen below normal melt every day this year. jim, you are making the same mistake the guys on the asif and those at NSIDC make when talking about so called “melt” of the greenland ice sheet. please read this from the DMI for a good explanation as to why so called “melt” modeled by NSIDC is very often nothing of the sort. Chilly – Now you’re making the same mistake as Vergent! I’m well aware of the difference between “melting” and “surface mass balance”. I’m also well aware that the DMI’s visualisation of “melting” generally doesn’t look the same as the NSIDC’s. That’s why I recommend looking at all the available data instead of just lurid headlines and freshly picked cherries. sorry about that jim, i should have known better 🙂 . i see friv is praying for the long range forecast to be accurate so there is big melt. strange position for someone to adopt. 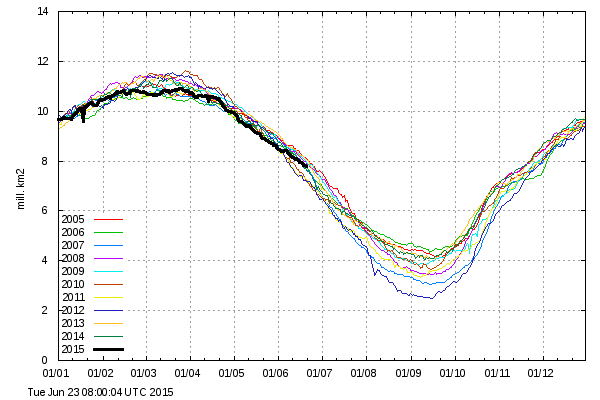 what do you think of the effect of the amo entering the cool phase in relation to future melt seasons ? for me ,hopefully it has a positive effect on the ice as the atlantic obviously as a far larger effect than the pacific. i note a few climatereanalyzer charts being posted on the asif . i do not know how you feel about their accuracy,but i would ask you to look at the area you live to judge how well they do. some ice posts by chris reynolds in the asif on the effects of the gac 2012 upon the ice . i tend to agree with his assessment . still a bit of a wishy washy melt season so far ,i think it will be at least the end of july before we see where it is heading,the big drops are still to come and with the large areas of cool anomalies is the north atlantic there is every chance we could see a few big storms from that side. these would have a far greater effect than anything from the pacific side,initially increasing compaction, but conditioning the ice for greater melt. looking at the last twenty years it would be rare to see three years of increased minimum extent in a row,so as much as i would like to see the last two years rebound turn into at least a mini recovery, i have my doubts as to it actually happening,we shall soon see. that should read some nice posts by chris reynolds, not ice. this keyboard (and possibly the operator 🙂 ) are on the way out. This from the polar portal is well worth a read Jim. I note there were not widescale retractions at the time by the media once this had been noted . b) estimate Greenland ice mass change near-realtime. The technique used to make near real-time estimates based on the reflectivity broke down in 2013, and yielded an inaccurately large ice loss result as reported in the Season Report. Polar Portal scientists are now busy assessing the physical processes underlying Greenland’s surprisingly neutral mass balance summer 2013. In the meantime, we have suspended further reflectivity-based Greenland mass change estimates. Plenty of LIES and Hysterics from Hoaxers GWC… on an almost Daily Basis..
Why not apply some of your skepticism towards daily Climate Scare’s posted at Huff Po or Think Progress?? By way of example I was publicly critical of the “North Pole is melting” nonsense in 2013 that was in fact a melt pond nowhere near the North Pole that just happened to have a webcam in it. And a bird’s backside! despite your advice the usual suspects on the asif are in full meltdown mode now jim. they better pray for accelerated melt or all those posts are going to leave them with egg on their faces. i find it hard to understand from people that have been on there for years,it would appear they have learnt nothing. quite a few actually want the ice to melt out as well,strange people. i note someone mentioned lots of rain next week for the cab. looking at current weather patterns i would not bet against it being snow.